Our recent field study workshop [FSW] in collaboration with Lucy Rees, and the Piornal Pottoka Project of Extremadura, has just concluded. Many behaviors have been added to our ongoing Ethogram project, amongst which I am thrilled to report on lichen licking behavior. Horses are usually considered to be grazers and to a lesser degree browsers and both these foraging forms have been documented extensively. In fact grazing can be understood as the ingestion of grassy or grass-like plants while browsing is the ingestion of woodier plants (McDonnell, 2003). In the former horses usually walk while grazing, placing one foot forward at a time and eating around it in at an arc type movement. 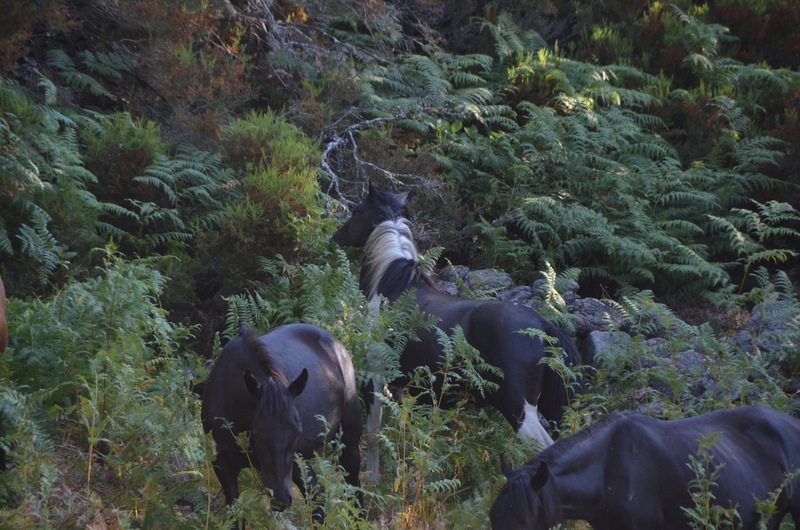 Browsing has been observed to be a more static form of foraging were the horse may reach up, down or sideways to eat foliage of woodier plants, shrubs and trees while standing almost stationary. 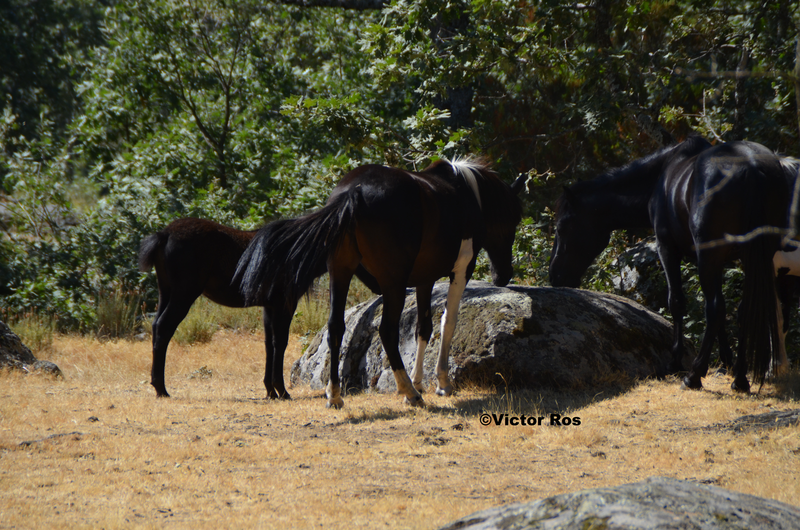 The image below shows members of a mixed bachelor band together with a stray (dispersed) mare and foal from an adjacent band with overlapping home ranges that gathered around a particular rock. The horses gathered facing the rock with heads lowered and at first sight, from a distance of approximately 100 meters, it seemed that the horses were scraping and eating stone. As we approached the group for a closer look it became evident that it was not the actual rocks that attracted them but the lichens and mosses growing upon these. The horses were observed to lick the lichens on the rock and in some cases flakes of lichen were observed to be licked-up and consumed. 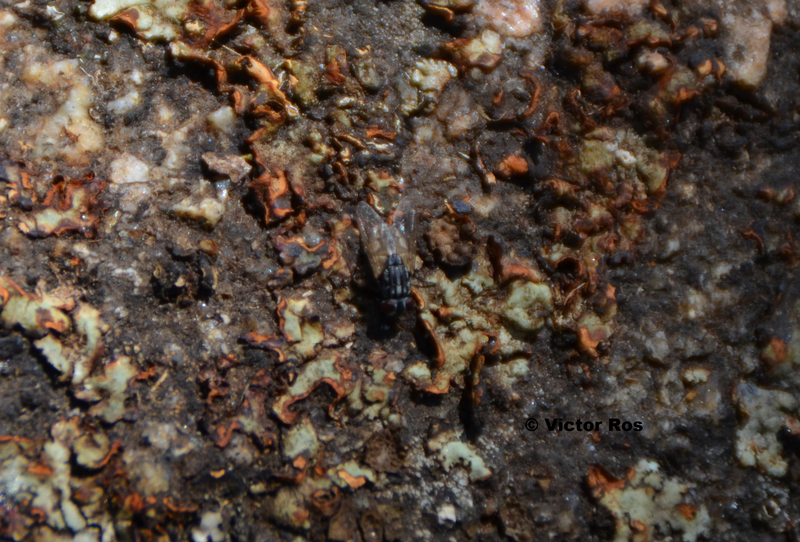 A lichen is neither plant nor fungi but a combination of these or more organisms (see below), and the form employed by horses in the acquisition and ingestion of lichen is neither that typical of grazing or that of browsing. In both forms discussed, plants are gathered into the mouth with lips curled and tongue, vegetation is then ripped in clumps by way of a jerking movement of the head while simultaneously chewing. With lichen, the horses observed were typically stationary such in browsing, while licking the flattened, crusty and granular crustose lichens that had fastened onto large rocks. Occasionally lichen flakes were licked-up, once moistened, or were alternately scraped off with the teeth of the lower jaw. Horses were also observed to peel away lichen flakes with both prehensile lips and apparently swallow. The licking of lichen and its ingestion is fairly similar to a number of behaviors categorized in Sue McDonnell’s: Equid Ethogram (2003). 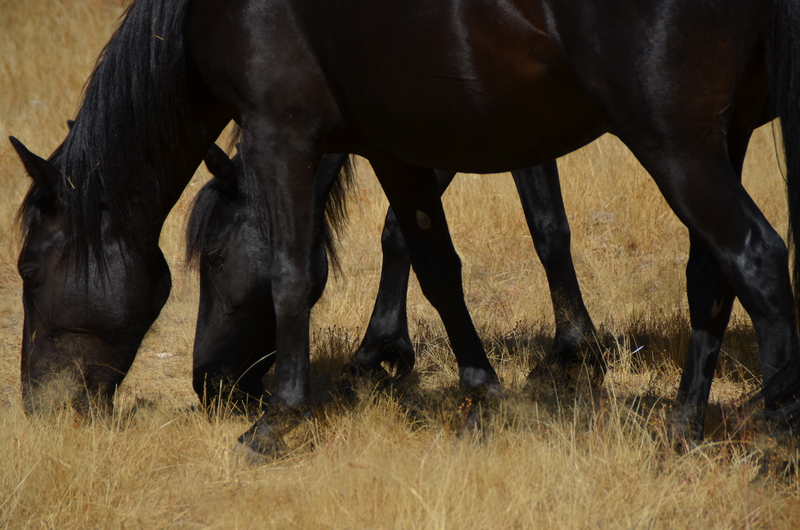 In fact by combining the lick behavior categorized in the ethogram in which horses explore the surroundings with their tongues, and that described under pica behavior as the ingestion of soil by drawing it into the mouth by way of tongue and lips, and swallowing, would give a pretty close approximation of the activity patterns involved in licking licken. Lichen Licking can thus be considered as a combination of licking and pica, an ingestion by way of moistening of the crustose lichen with the tongue, then drawing the lichen flakes into the mouth by way of tongue and lips and ultimately swallowing. The behavior was observed in short bouts lasting a mean of 2-3 minutes and much longer period that lasted up to 32 minutes. It should be noted that all 5 members of the mixed bachelor band along with a mare and foal from an adjacent band licked lichens. In particular the lengthiest lichen licking bout was by the mare “Gastain” and her 4 month foal (not yet named) who clocked 32 minutes each on a single large rock. This lengthy bout was preceded and followed of shorter 2-3 minute bouts on other rocks in the area. Lichens come in many shapes and sizes and are found in the majority of ecosystems from ice free polar-regions through to tropical rainforests. They have been known to provide a forage source to many small mammals and artiodactyl ungulates such as Caribou, Reindeer and mountain sheep. Lichens are not plants, algae or fungi per se. Instead lichens are an association between 2 or more organisms that form a composite symbiotic relationship, which at times may be mutually beneficial to fungi, algae and cyanobacteria alike, or on the other hand it may be parasitic in which only one of the actors, usually the fungi, derive benefits at the cost of the others. The fungal partner in the association is referred to as a mycobiont, while the non-fungal partner whether protista or monera is referred to as the photobiont, as these undergo photosynthesis which allows for the production of carbohydrates and thus the provision of nutrients for microbionts to harvest. 1. Fruticose – bushy structure which appear erect or pendulous and are markedly three-dimensional. 2.Crustose – Typically observed as flat crusts on or below rocks or under the bark of a tree. Crustosian lichens are markedly two dimensional and firmly attached to rocks, trees and other substrates by their entire lower surfaces, hiding in this way its entire undersurface. 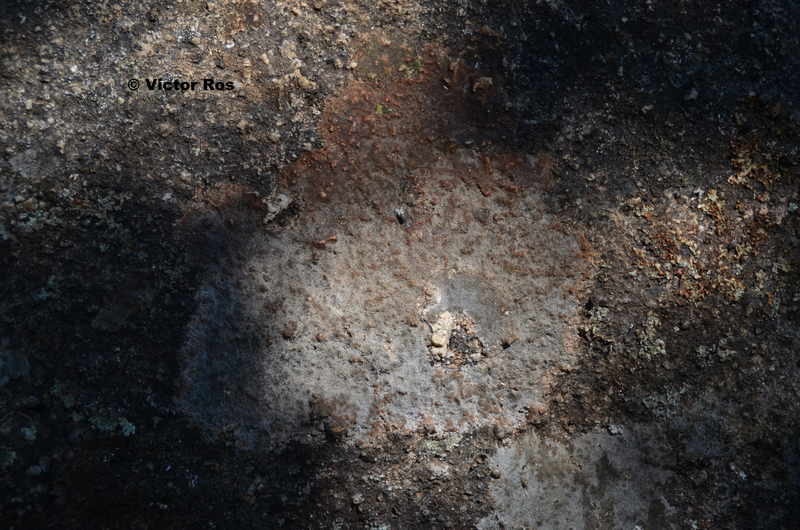 Close-up of the area preferred by the mare “Gastain” in her 32 minute lichen licking bout. The fly conveniently posed for scaling. 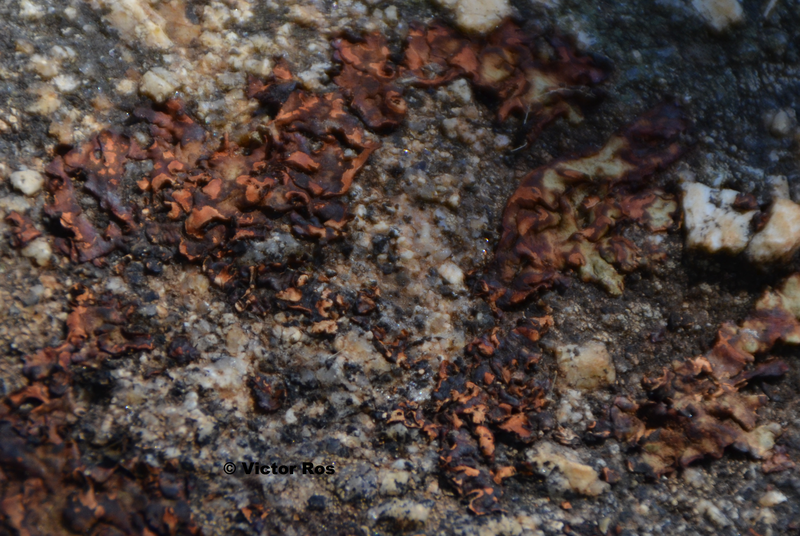 Close-up of the area preferred by the mare “Gastain” in her 2 minute lichen licking bout. 3.Foliose – flat, leaf-like structure halfway between crustose and fruticose lichens. 4.Squamulose – tiny, scale-like squamules form these lichen which are sometimes classified within the category of crustose or foliose lichens. Lichens come in many colours which clearly imply a richness of chemical compounds, the richness of which can only be understood through detailed analysis. These chemical compounds can be broken down into 2 further classes; primary metabolites that include amino acids, proteins, vitamins and polysaccharides which are normally soluble in water, and secondary metabolites which may include some antibiotics and chemical defenses against herbivorous vertebrates feeding on them. Samples have been taken for laboratory analysis and identification and results will be posted accordingly in due course. 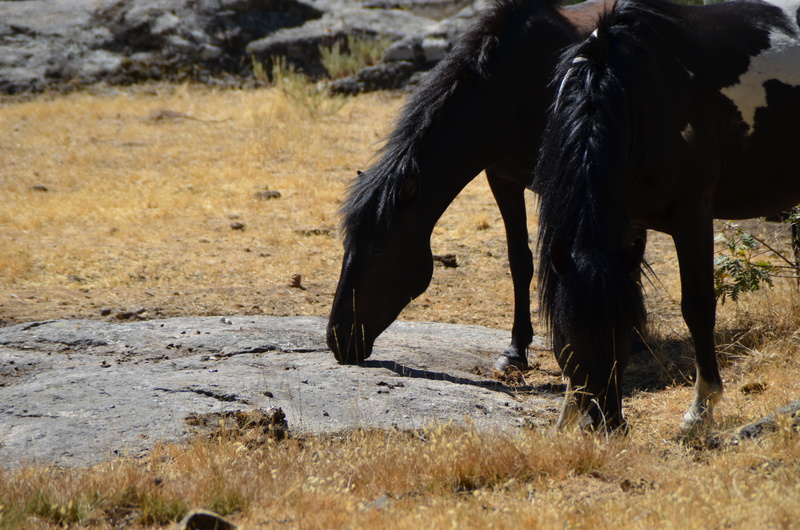 The horses were observed to be licking away at flattened, crusty and granular like crustose lichens. Enjoy the gallery! my 2 horses ate lichen on several occasions while in the mountains of montana this past summer. I thought it was strange, but figured there was minerals found in the lichen that they needed. they also ate moss.